The water crisis is a governance crisis. Many water related problems arise from inadequate and dis-functional governance settings, in relation to water, but also in relation to land management and climate change, rather than from problems of the resource base itself. The implementation of the ambitious SDGs poses considerable challenges to water governance. Bundling water fees with other social services can be used as an efficient tool to increase awareness and acceptance of water pricing, while the payments should be administered in a transparent way and benefit the entire community. 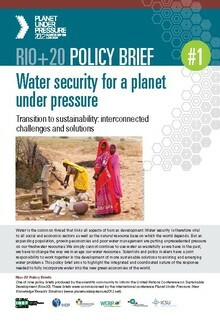 Stressing the importance of water supply and sanitation for improved human health, this policy brief calls on international, national and regional actors to consider the international goals on water and sanitation as ‘super-norms’, striving to innovate the socio-technical and institutional dimensions for integrated water, sanitation and hygiene. A physical geography based approach can complement cross country perspectives and can help to find solutions to development problems and application of these in different places. As the demand for water continues to increase while at the same time climate change puts pressure on existing hydrological systems, efficient usage of water becomes important. Estimations of past freshwater use are an important information source for thinking about the future of water and the development of water-related sectors. Increased pressures on water resources is caused by widespread land use changes and pollution as well as population growth, urbanisation and industrialisation amplified by climate change impacts. However, it is in large parts also caused by poor water management. This policy brief aims to highlight the integrated and coordinated nature of the response needed to fully incorporate water into the new green economies of the world. 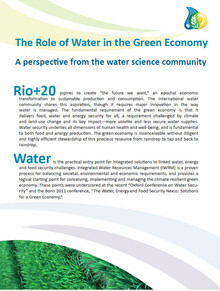 International Institute for Sustainable Development & Global Water System Project (2012): The Role of Water in the Green Economy: A perspective from the water science community. Key messages for Rio+20, which aspired to create “the future we want,” an epochal economic transformation to sustainable production and consumption. The international water community shares this aspiration, though it requires major innovation in the way water is managed.